New Airport Security Lanes In Atlanta Are 30 Percent More Efficient, TSA Chief Says : The Two-Way The two lanes, which were designed by Delta, were rolled out last month. TSA administrator Peter Neffenger told a Senate committee that "initial results show dramatic improvements." 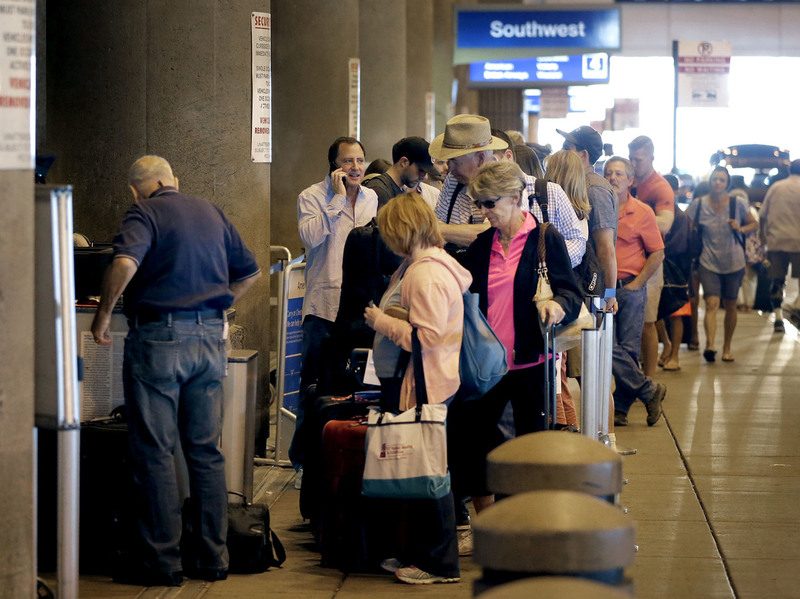 Passengers line up to check in before their flights in May at Sky Harbor International Airport in Phoenix. Two new automated security lanes at Atlanta's airport are aimed at reducing long wait times. A new type of airport security screening lane is being tested in Atlanta, and "initial results show dramatic improvements," according to the head of the Transportation Security Administration. The "innovation lanes" are aimed a reducing wait times, and Peter Neffenger says that two new automated lanes designed by Delta have shown a 30 percent improvement in efficiency since they were rolled out last month. Delta thinks this new model should be able to double the productivity of airport security lanes. Speaking at a hearing of the Senate Committee on Homeland Security and Governmental Affairs on Tuesday, Neffenger said these new lanes are "an example of the way in which we need to modernize and bring TSA into the 21st century." According to Delta's chief operating officer, Gil West, the airline "funded everything" and "went from concept to start-up in less than two months." He hails the results as a "game-changer." In the new lanes, customers "come through the lane not just one at a time, one after each other, but five at a time. You're able to move in the process at the speed you're capable of, not the person in front of you," West says. Rather than waiting single-file, there are five automated stations in a row for customers to deposit their belongings into bins. That means customers don't need to wait for the person in front of them to finish unloading before they move their luggage into the cue. The system also has an automatic rollers system and bin return, and diverts baggage out of the line if it requires further screening. It's similar to the system used at London's Heathrow Airport. Neffenger told the senators that the number of passengers screened annually continues to climb: "This year TSA will screen some 742 million people, projected. By comparison to 2013, TSA screened 643 million people, so our approach to screening requires a similar transformation." He adds that the TSA plans to launch similar projects with major airlines and airports in the coming months.